Michael Andrews seems to have it all. He’s a successful author and a minor celebrity living in Manhattan. It’s a pretty big step up from his humble Canadian upbringing. Of course, his lycanthropy poses a bit of a challenge. After waking up from his latest night on the town, he’s naked, he’s got a bullet hole in his leg, and he has a sneaking suspicion he ran into another wolf last night. If he’s going to make an evening talk show appearance to promote his latest book, he’ll need to figure out what happened the previous night without letting his occasional heroics get in the way. Standing in his way are an agent, an ex-girlfriend, a variety of goons, and a fellow wolf encroaching on his territory. It’s just another day in the life of a polite, small-town Canadian trying to stay alive in the Big Apple. 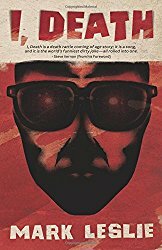 A Canadian Werewolf in New York is a humorous thriller about an ordinary man dealing with extraordinary circumstances. 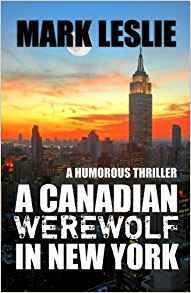 If you like seeing an everyman try to “do right” no matter the odds, then you’ll love this suspenseful and comedic tale of a Canadian bumpkin who happens to be part wolf. Read the short story that inspired the creation of this novel for free. THIS TIME AROUND is a story of approximately 10,000 words and involves the very first part of Michael’s day waking up naked in Battery Park and his need to find some clothes and make his way to a morning meeting. 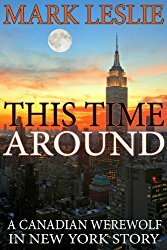 It wasn’t until after author Sean Costello read the story “This Time Around” and asked Mark what happens next that the concept for the full novel came to fruition. Mark’s response of: “Nothing happens next. That’s the entire story,” did not satisfy Costello, who insisted there was more that could be explored. And that’s what led to the full novel being born. There’s nowhere to hide when everybody you know or meet is trying to kill you. Scotty Desmond’s day begins like any other until his boss calls him into the office, pulls out a gun and starts shooting at him. 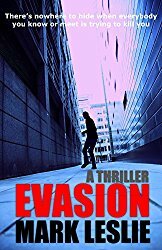 Scott manages to escape the surprise assassination attempt, but everyone else he meets, colleagues, friends and strangers alike are all similarly obsessed with killing him. Will Scott survive long enough to understand what is behind the relentless attacks and how it might relate to the investigation into his father’s mysterious death? Peter O’Mallick isn’t just having a bad day; he’s having a bad life. It’s bad enough when your girlfriend suddenly casts you a cold shoulder, your grades are slipping and those around you no longer understand what it’s like to walk in your shoes; but walking around with the innate power to end lives – something Peter begins to realize he has had since birth – takes the angst to a whole new level. And Hamlet thought he had it bad. Encouraged by his guidance counselor, the suicidal seventeen year old begins to blog about his experiences in order to try to understand this power and himself. The self-directed therapy helps, and strangers who follow his online story virtually befriend him, as it appears that his curse is mostly limited to those he is in close contact with. However, there is one stranger secretly following his story who isn’t there to understand, help or cheer him on; just as Peter begins to understand that being born as a harbinger for death might actually be a blessing rather than a curse, this stranger is intent on finding a way to use Peter’s power for nefarious purposes. You Had One Job! And Nailed It.